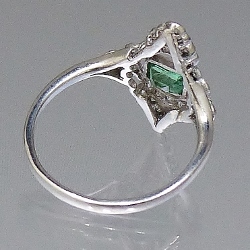 Most Unusual 1920s Emerald & Diamond Old Cluster Ring [SH8349] - £1,250.00 : loveVintageDiamonds.com, Your Vintage Diamond Dreams Come True! 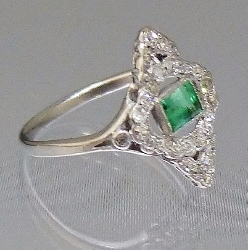 This most unusual cluster ring boasts a fine emerald-cut vibrant emerald in the centre, approx. 3 x 4.5mms, set horizontally in a collet-setting with mille-graine edging. This is framed by a stunning diamond-set surround, containing thirty eight-cut diamonds, approx. 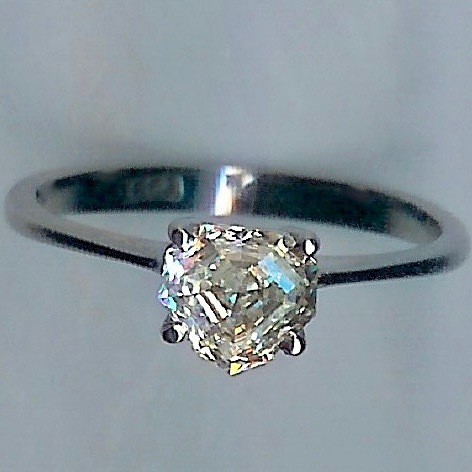 0.02cts ea, with a combined diamond-weight of approx. 0.60cts, in an unusual, clearly 1920s shape. The ring is white throughout remains unmarked, and tests as platinum. 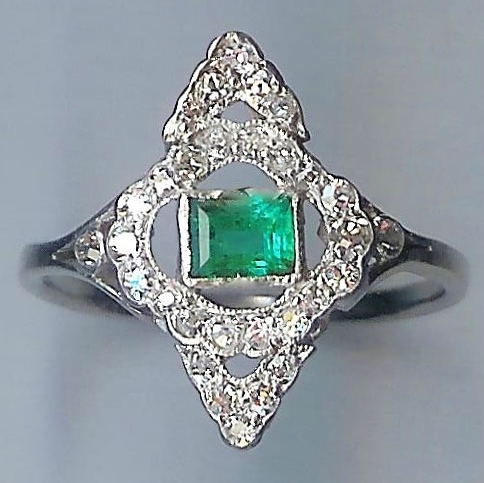 STONES: Emerald, approx. 3 x 4.5mms. DIAMOND WEIGHT: approx. 0.60cts total.